When my favorite variety of Greek yogurt was on sale 10 for $10, I stocked up. If you were to open my fridge, especially a week ago, you’d think I was on a Greek yogurt binge or cleanse. Due to the plentiful amount of protein in Greek yogurt, I love to have it at breakfast for some serious staying power. Plus, it travels really well to work, campus, or where ever I’m off to. Normally I pair my yogurt with a piece of fruit, but here lately, I wanted a change. I wanted granola, but not a variety that was loaded with carbs and sugar. I did a little research and found a recipe that used cranberries and apple cider — how fitting for this time of year! Most of the recipe ingredients are staple, non-perishables in my pantry and offer up lots of nutrition. 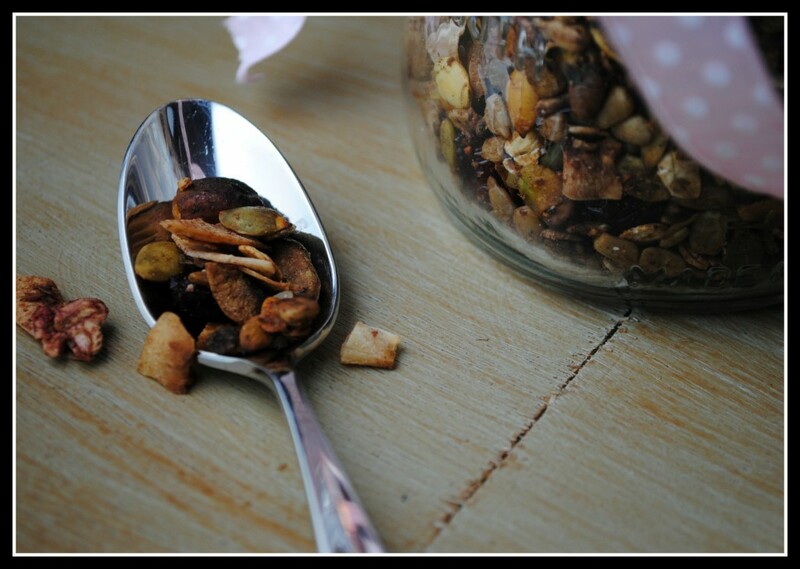 The more nuts and seeds I can include in my diet, the better. I, along with most Americans, likely don’t intake enough heart-healthy mono and polyunsaturated fatty acids. Which are not only essential, but help keep cholesterol levels within desirable ranges. On a positive note, and since I haven’t talked about my PCOS management in LONG time…my average blood glucose is down 7 mg/dl. Is that a lot? No. But it wasn’t much out of range to begin with. And, I weigh 5-6 pounds less than this time last year, too! Going into the holiday season with all the food, sugar, and butter, it’s important for me to remember the strides I have made health-wise in the last year — and the ones I still need to improve upon. My weight is a continuous battle, but keeping my blood sugars where they should be can help me work towards my happy weight. 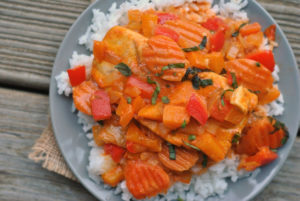 And this recipe, is packed with lots of the good. Rich in heart-healthy fats, antioxidants, and fiber. 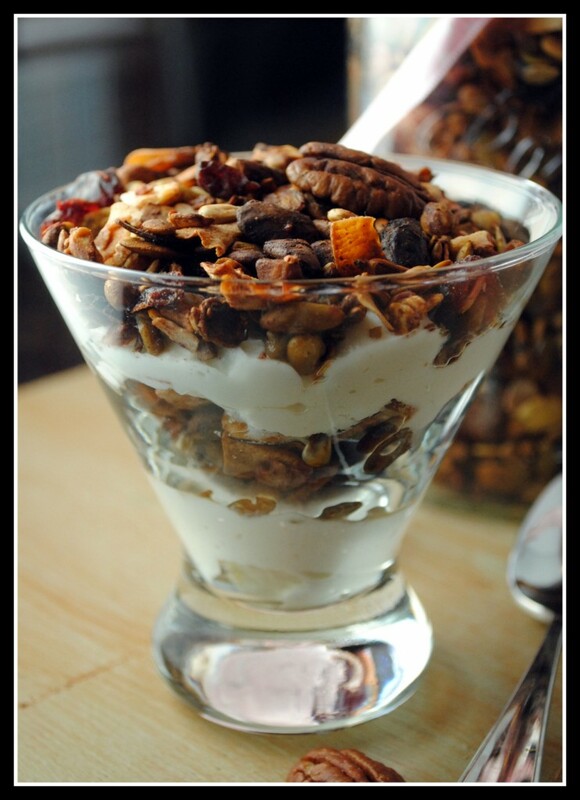 Oh, and perfect to sprinkle over your morning yogurt, or to create a little yogurt parfait! Blend the fresh cranberries, apple cider, maple syrup, cinnamon and ginger in a blender or food processor. Combine remaining ingredients in a large bowl and toss to combine. Drizzle the cranberry-cider mixture over the dry ingredients and toss to coat. Line a baking sheet with foil and spray with non-stick cooking spray. 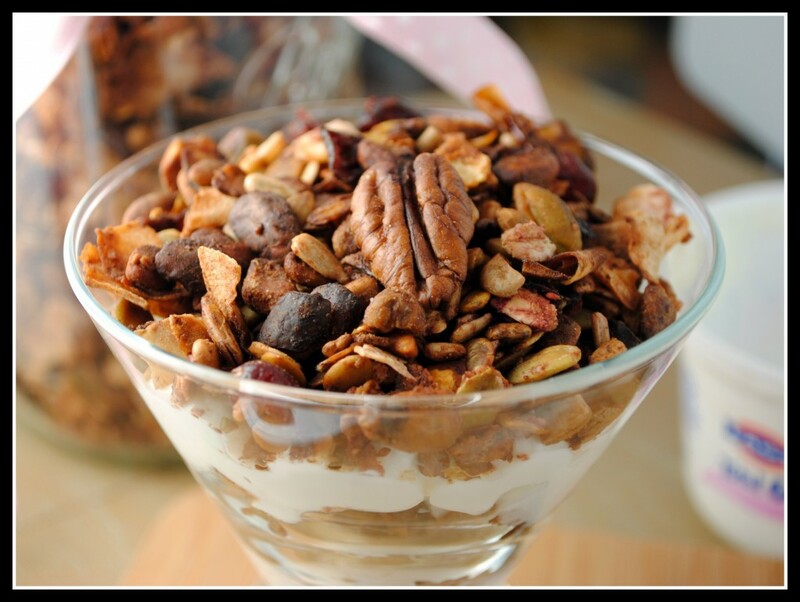 Arrange the granola in a single layer and bake for 30-35 minutes, stirring every 15 minutes. Allow to cool (and harden) before serving. Store in an airtight container for up to 10 days. Yield: ~5 1/2 cups (22 servings – 1/4 cup each). Result: Crunchy, nutty, and faintly sweet. This recipe is simple to make and keeps well in an air-tight container for up to 2 weeks. It’s a great way to bring festive fall flavors to breakfast, leaving behind all the sugar and butter. Enjoy! A day of house decorating and baking ahead! Thanksgiving last night was a success – stay tuned for those recipes and photos! 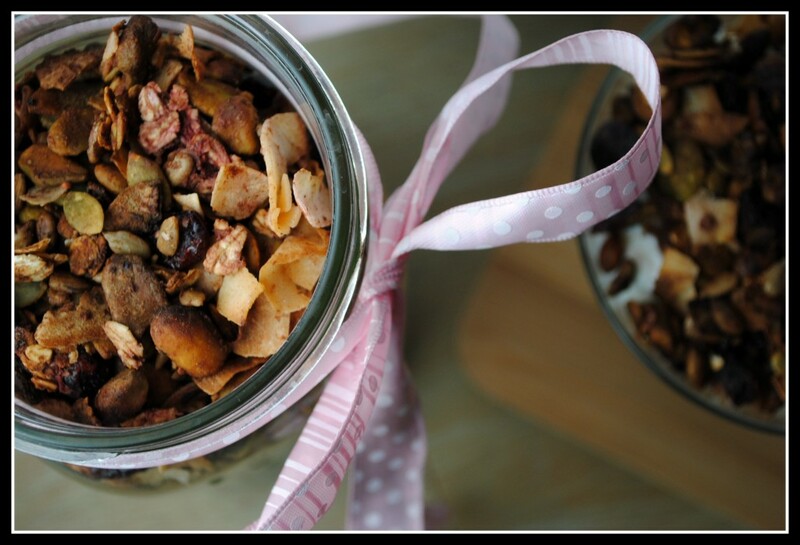 I love granola as well, but like you said, it can be hard to find a healthy recipe. I will be trying this one for sure! The sugar content is usually my only caveat when it comes to granola. 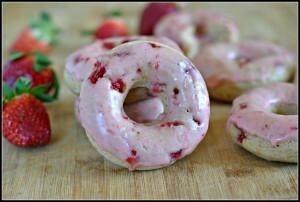 This recipe however, looks pretty fantastic! Great job with the blood sugar! How do you go about lowering your LDL? This looks great! 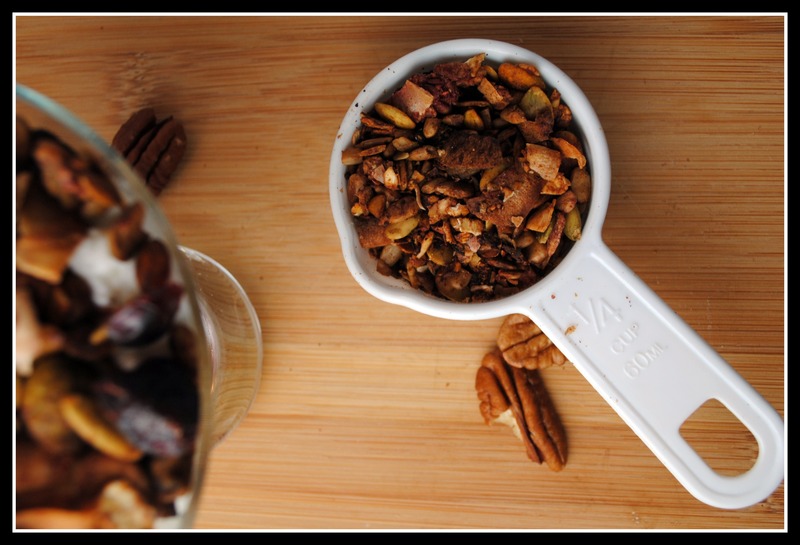 I’m always looking for new granola recipes, and I love that this has no added butter/oil or refined sugars. This sounds great! 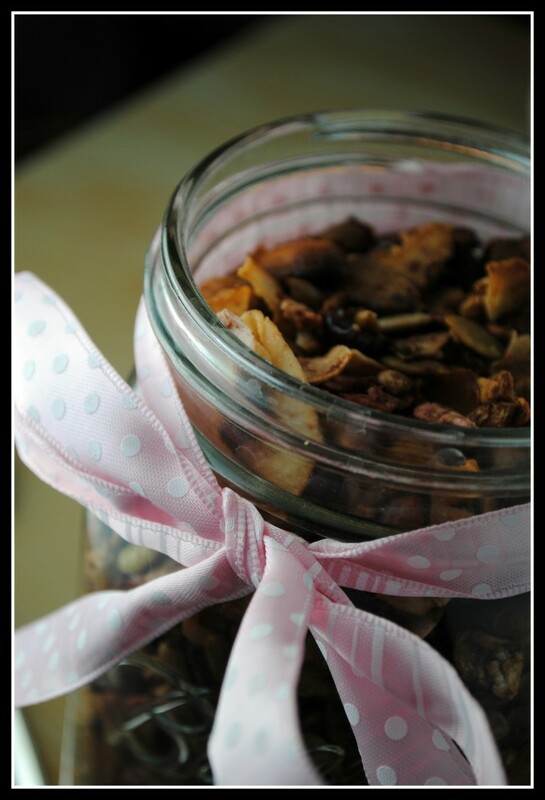 I love a good homemade granola.